Thanks for joining the Hodgepodge this week...be sure to link your own post at the end of mine. I do go on so just keep a scrollin' and you'll get there eventually. I promise. I have been on a couple of sleigh rides. One February school break we visited Neuschwanstein Castle which is located in the southern part of Bavaria. It is spectacular. I know I use that word a lot but ask anyone who has ever seen it and they will tell you the same...no other word will do. 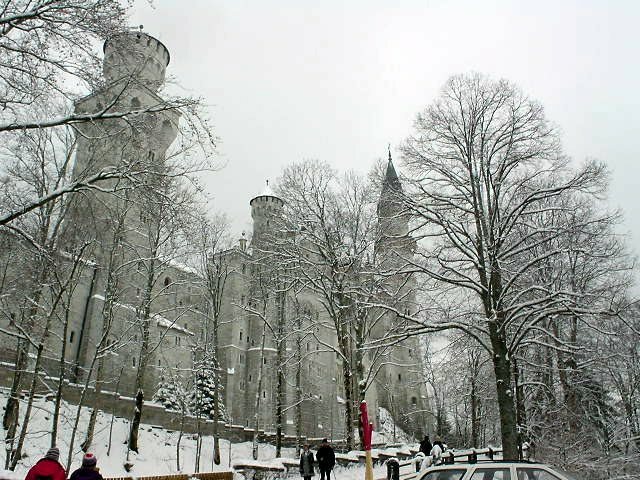 It was built for King Ludwig who died not long after moving in and its also the castle that inspired Disney. You can see some truly amazing pictures here. 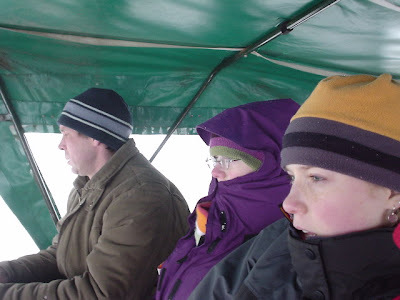 Anyway, it's cold in Bavaria in February and there was snow on the ground so we elected to take a sleigh part way up the hill. It didn't go all the way to the entrance but it brought us pretty close. It was magical. Can you tell it's cold? sweet 13 and 15 year old selves in this photo? It really must be seen from a wider angle because this picture does not do it justice. Their 13 and 15 year old selves went and grew up. Still cold and still cute though. And I promise all my answers will not be this long. 2. What's your policy on 'chain mail'...you know, the emails you receive that are often some sort of poem/blessing/good wish that ask you to send it on to 10 or 12 friends? Do you delete without opening, read and trash, read and trash and then worry you won't be blessed/lucky/protected? Do you delete the sender from your contact list or just go ahead and send the love onward? Well, rest assured if you are one of my friends who loves to send me this type of thing I am not deleting you from my contact list. Some I do delete without reading but sometimes I consider the source and take a peek. If I've been away from the computer and my inbox is piled high those are the first things to go into the bin unopened. Every now and then something interesting or funny or meaningful does slip thru in the form of a 'chain letter'. I love Mr. Parker, the dad in A Christmas Story. He is played by Darren McGavin and he is brilliant. If you've never seen A Christmas story you are missing out! I love the smell of cinnamon in candles, baked treats, and simmering wassail. A little...usually the logistics. We've traveled to family somewhere in America almost every Christmas since we were married. Last year I hosted Christmas for only the fourth time in my 26+ years of marriage. I love being with family on this special day but am longing to do so in my own home now. My husband has a job he enjoys. We have a comfortable home. I am first...the benefits of living on the West Coast!! I love cinnamon too. Yum and it does look very cold...very very cold. But very fun and beautiful too!! Sure #1 was easy for you, you even have pictures. Looks wonderful and I'm jealous!! Traveling at Christmas would throw me over the edge and we don't want to go there, do we!! I agree with #7, I was going to say more similar to your answer but I stayed with one. Thanks for the questions, loved your answers. 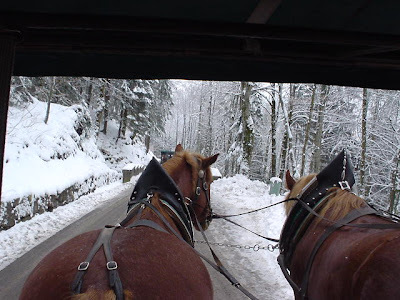 Love your Corrie ten Boom quote and your sleigh ride pictures. That castle is beautiful. Oh, I LOVE that movie! "Daddy's gonna kill Ralphie!" LOL! I had already written my post for today, so I'll catch ya next week! You never cease to amaze me with your tales of travel. You are a woman of the world! I LOVE the sleigh ride photos! Thanks again for hosting...despite your jet lag! Those pictures of your sleigh ride are indeed spectacular! We've been there twice but never in the winter. It is a gorgeous place. Thanks for sharing with us. The sleigh ride and carriage photos made me jealous. That is a great quote. And I have apple cinnamon candles all over my house this time of year. I can't get enough! We love A Christmas Story at our house. Fra-gee-lee--must be Italian. We quote it all the time. Kind of jealous of your sleigh ride--what a place to ride a sleigh. Great quote, it sure gives you a lot to think about doesn't it. And A Christmas Story is my all time favorite Christmas movie, like you we watch it every year. The pictures of your sleigh rides are so sweet (seeing the younger girls contrasted with the older girls) ... and the picture of the castle is just gorgeous! A Christmas Story -- it just can't be beat. It's our Christmas Eve tradition (my hubby doesn't much like it, but the rest of us die laughing every year). Loved the pic of the castle! What a gorgeous building. I finally got to go to Disneyland for the first time since we moved to California, and I read about the castle. Your picture makes me want to see it in person even more. Would you believe I have never seen The Christmas Story, we will have to watch that this year. Enjoyed your answers and your pictures were beautiful! I love traveling through your posts! Enjoyed your answers and Thanks so much for hosting this fun meme. That castle is B U tiful, as are your daughters! Love your blog and the Hodgepodge meme! I blog at http://reneeannsmith.com/ and will try to join you all some Wednesday . . . looks like fun! That castle ride looked awesome! I´m sure it will stay an unforgettable memory. I like you on those chain mails. If I have time, I´ll read some,if not delete. A Christmas Story never, ever gets old. I love it. This year I think our youngest is old enough to watch. Thanks for the reminder! You have the BEST travel pictures! I was a little busy to get to your Hodge Podge carnival, but I really wanted to. I have never seen Christmas Story in its entirety. Looks like that is now on my list.